string(1198) "Resource Centre > Uncategorized > ITUC Global Rights Index 2018: Ten worst countries in the world for working people"
The 2018 ITUC Global Rights Index depicts the world’s worst countries for workers by rating 142 countries on a scale from 1-5 based on the degree of respect for workers’ rights with 1 being the best rating and 5 the worst rating. Violations are recorded each year from April to March. 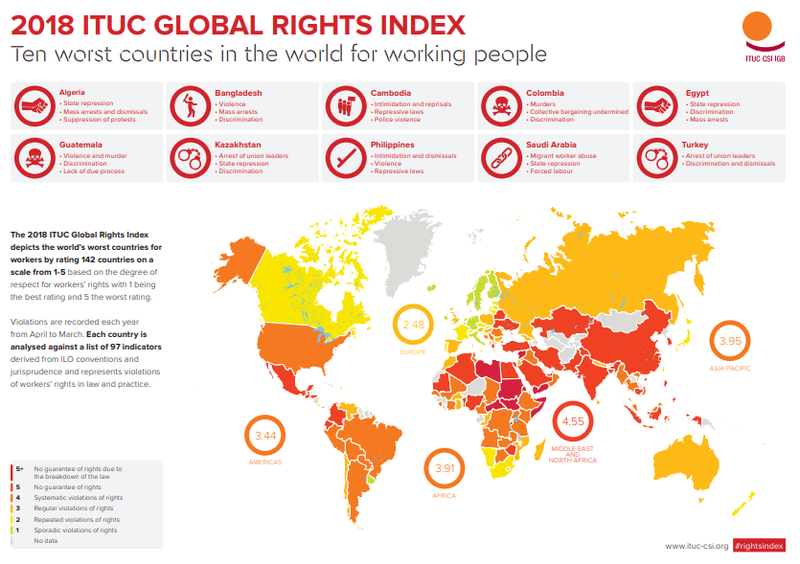 Each country is analysed against a list of 97 indicators derived from ILO conventions and jurisprudence and represents violations of workers’ rights in law and practice.